The Alps have been home to exceptional cheeses from Switzerland, France, Germany, Austria and northern Italy since the 11th century. These cooked and pressed, white-to-golden rustic cheeses were handcrafted to weather the frequent snow-packed storms raging through the Alps. Lucky for us, Wisconsin cheesemakers have been producing award-winning, alpine-style cheeses in our own backyard for nearly 200 years. We use traditional techniques including copper vats to realize the sky’s-the-limit potential of these nutty, rich, full-bodied cheeses. Whether it’s blizzardy outside or not, anytime is the right time for these wonderful wonders from Wisconsin! Because the outside of these surface-ripened cheeses have been hand-rubbed with a smear as they age, you will want to carefully remove the rind before grating, slicing, melting or serving these exquisite cheeses. 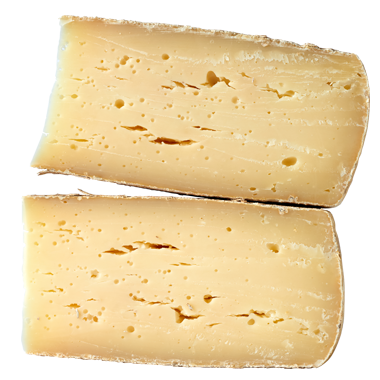 Mountain cheeses like a robust drink with a slight sweetness, so we recommend Belgian-style ales, ambers, brown ales, bocks and stouts. For wine, any fruit-forward red or white such as cabernet sauvignon, zinfandel, beaujolais, riesling or grüner veltliner will do. Want more punch? Port, madeira, scotch and rye whiskey all love our alpine cheeses. These are our go-to fall and winter melters. They have such great flavor and texture and they melt with such ease. We love to cube them into fondue, grate them into gratins, quiches, savory tarts and soufflés, and thinly slice them onto alpine-style soups like French Onion. If we’re including them on a cheese board, we often pair them with a whole grain crusty bread, oil-cured mushrooms, pickled vegetables, smoked fish and meats along with roasted nuts.